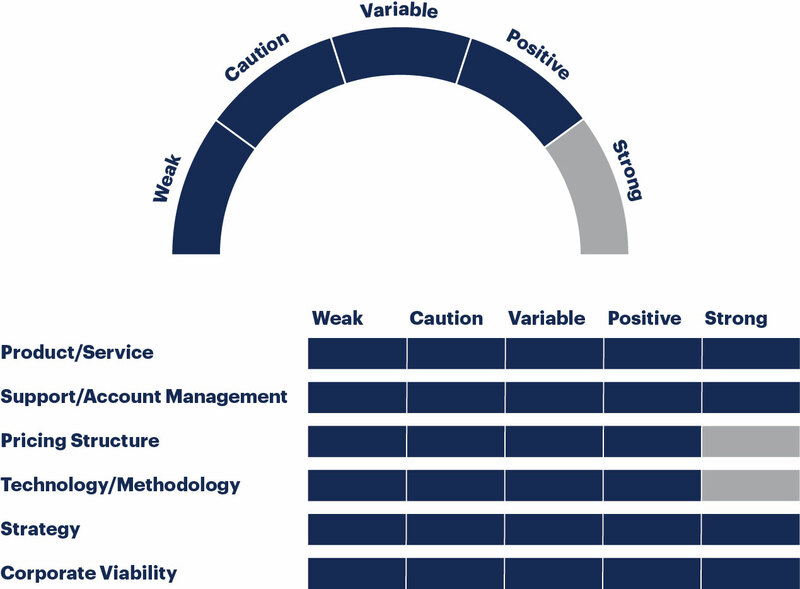 Vendor Ratings also deliver a holistic view of providers’ offerings and strategic directions to help you see how these align with your business objectives and ensure you have a balanced provider portfolio. What is our vendor selection criteria? We reserve the right to choose additional providers for strategic reasons, such as criticality to our clients’ businesses. Technology providers with a clear focus, solid products and an advantageous market position may be rated Positive or Strong. Providers that face challenges in these areas may be rated Caution or Weak. Those that have potential but still have some areas to develop further are rated Variable. Strong. Customers can feel comfortable investing in a continued relationship with this provider. Potential customers should consider this provider a strong choice for new strategic investments. Positive. Customers should continue planned investments. Potential customers should consider this provider a viable choice for strategic or tactical investments, while planning for known limitations. Variable. Customers should consider the short- and long-term impact of possible changes in status. Potential customers should factor issues and opportunities related to the ongoing evolution and maturity of this provider into their decisions. Caution. Customers should understand challenges in relevant areas and develop contingency plans based on risk tolerance and possible business impact. Potential customers should consider the provider’s challenges in their due diligence. Weak. Customers should execute contingency options. Potential customers should consider this provider only for tactical investments with rapid payback.